The final chapter of the HORSE pentology. Scud and Sussudio teleport to heaven and meet their maker. Someone's got answers and a question of their own. We find that Sussudio has a very famous father. When all is said and done, S & S will have to shoot their way out of heaven. 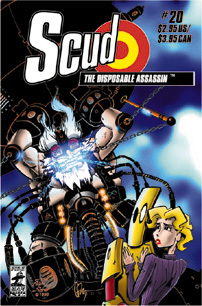 There's just 1 issue left of Scud: The Disposable Assassin. Buy your back issues, buy this issue, and hang on tight. 15 pages of this book contain a mini Schrab one-shot called Black Octopus. Witness the violent, sexual antics of a sixteen year old female cat burglar- years before Scud existed.